Though he may not speak of them, the memories still dwell inside Jacob Jankowski's ninety-something-year-old mind. Memories of himself as a young man, tossed by fate onto a rickety train that was home to the Benzini Brothers Most Spectacular Show on Earth. Memories of a world filled with freaks and clowns, with wonder and pain and anger and passion; a world with its own narrow, irrational rules, its own way of life, and its ownway of death. The world of the circus: to Jacob it was both salvation and a living hell. Jacob was there because his luck had run outorphaned and penniless, he had no direction until he landed on this locomotive "ship of fools." It was the early part of the Great Depression, and everyone in this third-rate circus was lucky to have any job at all. Marlena, the star of the equestrian act, was there because she fell in love with the wrong man, a handsome circus boss with a wide mean streak. And Rosie the elephant was there because she was the great gray hope, the new act that was going to be the salvation of the circus; the only problem was, Rosie didn't have an actin fact, she couldn't even follow instructions. The bond that grew among this unlikely trio was one of love and trust, and ultimately, it was their only hope for survival. 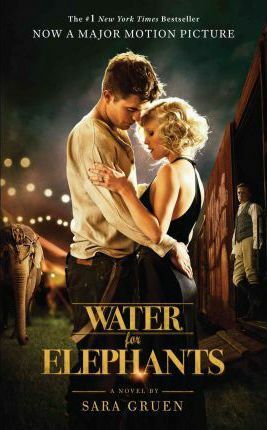 Surprising, poignant, and funny, Water for Elephants is that rare novel with a story so engrossing, one is reluctant to put it down; with characters so engaging, they continue to live long after the last page has been turned; with a world built of wonder, a world so real, one starts to breathe its air. Edition Statement Media Tie-In ed.